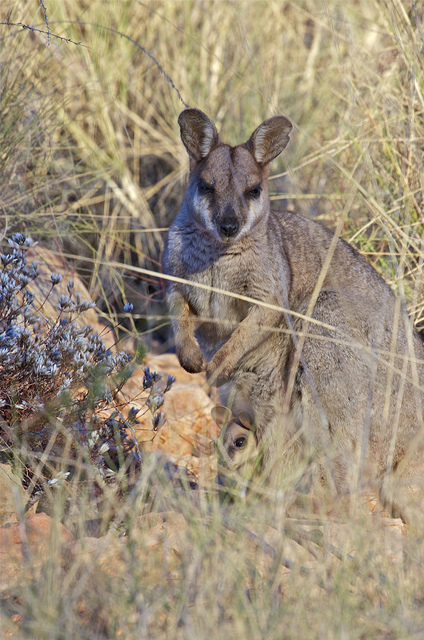 I think that the little-known purple-necked rock-wallaby is a really cute marsupial, so I thought that I would write about them today. Purple-necked rock-wallabies were first identified in 1924, but they weren’t classified as a separate species until 2001, so they are a very new species. The purple colouring comes from a gland on their neck. The purple washes off in the rain. They live in remote central Queensland in Australia. They live in small colonies of about 20 animals. Whilst they aren’t considered under threat of extinction, they do suffer from competition with introduced species, especially feral goats. Are there any other interesting facts that you would like to share about Purple-Necked Rock-Wallabies?